Welcome to the Famous Frets Website! 2. Steve’s Blog: will be populated with articles which are not about famous guitars, but cool or quirky jobs Steve encounters when setting up guitars (which is how Steve earns a crust). One such story is of the Russian made guitar which was fitted with accordion buttons because the parent company made accordions! Or the emergency repair neck break which had to be turned round in 24hrs because a gig depended on the guitar being fixed. Steve Clarke has been a guitar tech for over 30 years and during this time he has re-fretted, repaired, altered, customized and created Relic look-a-like guitars. He is totally passionate about what he does and this is reflected in every job he undertakes. 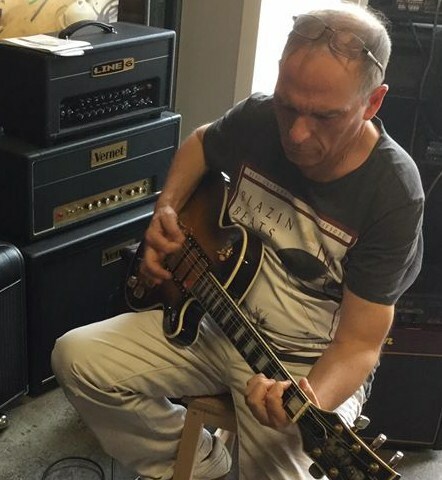 Based in Manchester, UK, Steve has been a guitarist, songwriter and producer playing guitar in bands such as The Drones and Taxi. Although no longer gigging, Steve’s passion for playing, writing music and sorting out the tech side of things helps him to communicate with his customers as he understands exactly what they need. Les Paul and Steve Clarke having a beer and a chat!